entry on all tall ships at the festival is subject to ID anD baggage check as per Transport Canada regulations. Your cooperation is greatly appreciated. Cruise through history at Canal Days! In 2009, the St. Lawrence Seaway celebrated it's 50th anniversary. The Welland Canal is an intrinsic part of the Seaway system and is still a very active trade and commerce route so it's business as usual as giant freighters, barges, and lakers glide past the festival all weekend long. Only in Port Colborne does the current Welland Canal pass directly through the downtown business district, and only during Canal Days will visitors find an impressive array of special guests: Tall Ships, Coast Guard vessels, a working Fire Boat, and many other ships along the wall at historic West Street. Many of these ships are open for public viewing, and many of the ships' crew interact with festival guests, or compete in marine challenges. Lake Erie Tall Ship Cruises are available and guests can also book a sunset dinner cruise, or view the spectacular Canal Days Fireworks from the deck of the Empire Sandy. What better way to celebrate the height of summer than to bring all the elements together - the feel of the wind and the deck beneath your feet, the spray of the water, the warmth of the air, and the fires of celebration in the sky overhead. For advance tickets call: 905-834-7572. Tickets on sale now. For cruise ticket prices and menu selection please visit the Tall Ship Cruises page. For more information about the Empire Sandy, click here. On October 7, 1960, an unprecedented event occured in American History. On that night, at the age of 60, the Edward M. Cotter's extraodinary firefighting abilities were called upon to help Buffalo's fellow firefighters in another country. A blaze erupted in the eight-story Maple Leaf Milling Company, a grain and milling company in Port Colborne. Despite their efforts, with no fireboat protection of their own, the fire was soon out-of-control. The Port Colborne Fire Dept. desperately needed help and the call went out requesting the Cotter. At approximately 8:30pm, with no radar of her own to help her navigate, the Cotter began her dangerous trek across the often trecherous waters of Lake Erie, escorted by a Coast Guard cutter. Two hours after receiving the call, the Cotter arrived. With all her guns brought to bear, she fought for more than four hours until the blaze was finally extinguished. On that day, the Edward M. Cotter became the first fireboat in the United States to cross the international line to fight a fire. USS Niagara, commonly called the US Brig Niagara or the Flagship Niagara, is a wooden-hulled snow-brig that served as the relief flagship for Oliver Hazard Perry in the Battle of Lake Erie during the War of 1812. The Lettie G. Howard is a two-masted wooden-hulled fishing schooner. Historically, The Lettie G. Howard was a fishing vessel, sailing around the United States and later in Central America. However, in the modern day the Lettie G. Howard is not only a floating museum, but a sailing school vessel training ship in service with the U.S Coast Guard. She was built in 1893 at a shipyard in Essex, Massachusetts by Arthur D. Story. The Lettie G. Howard has a long and illustrious history. Until 1901 she fished on the Grand Banks, when she ran aground in Gurnet Point Massachusetts. A year later, she was sold to E.E Saunders, who used the Lettie G. Howard to fish off the coasts of Mexico. The Lettie G. Howard was then decommissioned 1922, and completely rebuilt in 1923 and given the new name Mystic C. In the year 1966 she was sold to Historic Ship Associates in Gloucester Massachusetts, who attempted to convert her into a museum ship. She was even renamed again, this time called the Caviare in a case of mistaken identity, after another ship of that name that sailed in 1891. However, this attempt failed, and in 1968 she was sold to the South Street Seaport Museum. She was fully restored and renamed by 1991 and is now the Lettie G. Howard that we see today. In 2014, she received the Tall ships America 2014 sail training vessel of the year award and the New York Landmarks Conservancy Lucy G. Moses Preservation Awards. In 2015, the vessel and crew achieved third place in the Gloucester Schooner Festival’s Esperanto Cup. 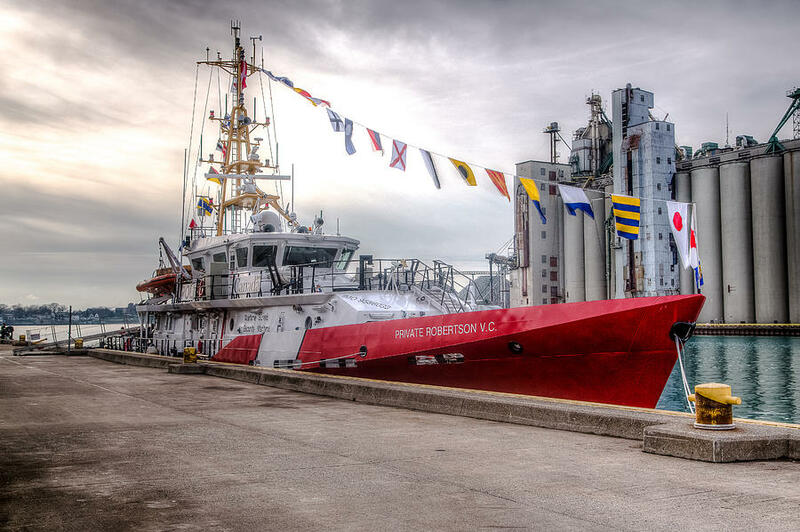 The latest ship to join Canadian Fleet Atlantic also happens to be the RCN’s longest serving commissioned vessel. HMCS Oriole, Canada’s Navy tall ship, was inducted into the fleet with a small ceremony at HMC Dockyard on May 29, just minutes before the ship and her crew departed Halifax for the St. Lawrence Seaway and the 2018 Great Lakes Deployment. Oriole, built in 1921, then donated to the RCN and commissioned in 1952, is essentially an ambassador ship for the Navy, used for public outreach and for training junior sailors. The 31-metre tall sailing ketch was previously based at CFB Esquimalt, and the goal in transferring her to the east coast is to give a different segment of the Canadian population a chance to enjoy the history and heritage that Oriole offers. The Coast Guard Ship Private Robertson V.C. is a mid-shore patrol vessel stationed in Burlington Ontario. The ship is a primary platform for the joint Canadian Coast Guard and Royal Canadian Mounted Police Marine Security Enforcement Team. The primary mission of the program is to enhance national security, respond to potential threats, and secure the border on the Great Lakes and St. Lawrence Seaway. $5.00/fee total, wrist band policy for both vessels. All times and fees are subject to change without notice. Please note weather conditions may affect tour times.